Hi, Good Morning, Thank you, friends and viewers. 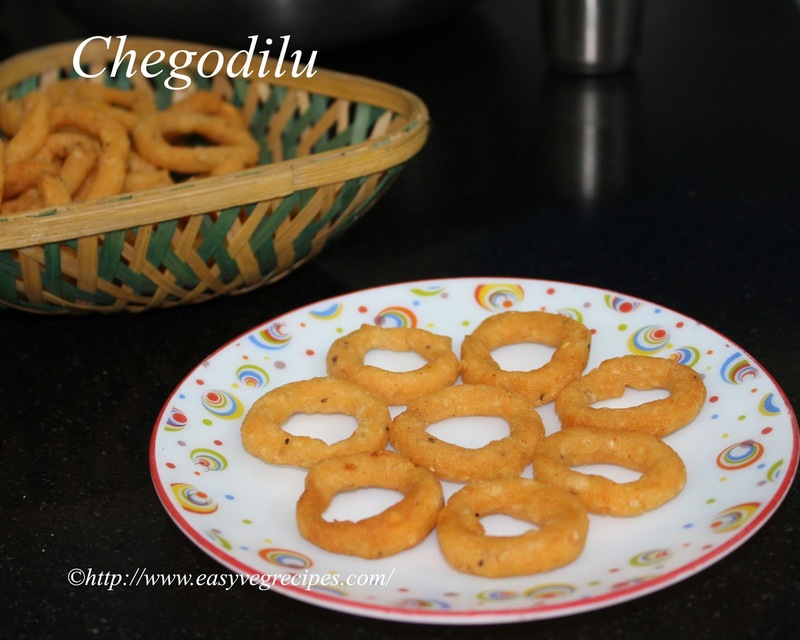 Today I will post how to make chegodilu recipe. First of all, I should thank Yamuna Dilli, far related cousin for inspiring me to make them. They stay in Vizag, a place in Andhra State. I stay in Hyderabad, a capital of State of Telangana. She directed me remotely, how to do it and gave simple but very important tips to follow while making them. First time I made only 15 chegodilu, they were very tasty and perfect. They went off like hotcakes, in a jiffy all were finished. So I had to repeat them. This time I made a bit large quantity. Making them is easy but they take longer time to cook. We need to check the heat of oil while cooking them. We need to adjust it accordingly. If we cook them in high flame they burn outside and does not cook inside. If the flame is very low they will be soggy. So first heat the oil till the fumes comes up, then reduce the flame. 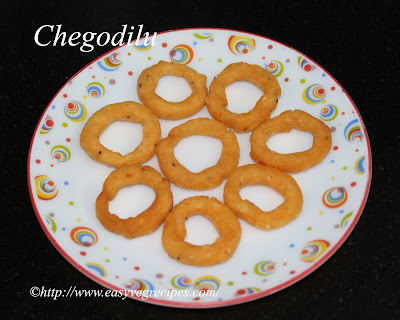 While adding chegodilu to the oil keep the flame in medium and fry them in medium flame only. Soak moong dal/green gram or pesara pappu for half an hour. Drain excess water and keep it aside. Boil water in a wide thick bottomed kadai, add salt, red chilli powder, ajwain seeds, sesame seeds and moong dal to it. Add a tablespoon of oil to it. While stirring continuously and steadily add rice flour to it. Mix it well so that entire rice flour cooks perfectly, without any lumps left behind. Allow this to cool till we can handle it. Once it is cooled to handle with hands, slowly knead it. Check if there is any lumps, press them gently with fingers. If those small lumps are left unattended, they will burst in the oil. Now the dough to make chegodilu is ready. Grease your hand with little oil, take small gooseberry sized dough. Roll it on a clean surface till it turns into a small string like. Now carefully, joil the edges and gently press them to make it a ring. Do not roll all of them at one go. Check whether the oil is hot enough by dropping small bit of dough. If the oil sizzles and the dough come up immediately oil is heat enough to make chegodilu. Lower the flame, slowly drop five or six chegodilu at one go. Fry them in medium flame till they turn into light brown. Fry them even after the sizzling of oil stops. Remove them from oil once they rise to the surface, drop them on to a absorbent paper. Repeat the same with the rest of the dough. But cover the dough and the prepared chegodilu with a damp cloth to avoid from drying. Cool completley before storing them in an airtight container.